It’s time for A Personal Photo Challenge! “Windows and Doors” is the theme this month. I really like to photograph these architectural features, and they are certainly popular with many photographers and non-photographers. 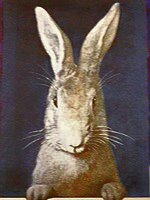 All of the images for this challenge come from my digital archives. However, each of the images received a fresh, first-time edit. The images were taken at a famous cottage while on a journey. What cottage, you ask? Canada’s historic Green Gables home, located on Prince Edward Island! I know many of you are fans of the Anne of Green Gables story. I have to confess that I quickly read the book – for the first time - right before our trip in 2011. So at least I got an appreciation for the locale and setting before our arrival. Our visit would have been positively delightful if the site was not crawling with tourists (like us). As some of you well know, huge crowds of people and photography don’t mix very well unless the subject is people. So I had to be a bit creative when I framed up my shots. One lady on our tour said I was “documenting” the place, LOL. I must have been in a “windows and doors” state of mind, because that was usually where I pointed the camera lens. Of course, I had to ensure that I captured the poignant setting of Anne’s bedroom. And we know that she would have gazed out the window to view her new world! We don’t practice afternoon tea here in the USA. But, it is quite a lovely custom that is actively practiced in many parts of Canada and by some of my blogging friends! Lace-covered windows provide a delightful ambiance. I have always adored lace, so I was noticing all of the windows that were graced with these beautiful artisan wisps. And, I sure didn’t miss the gentle teasing of morning light as it streamed through one upstairs window. Goodness knows how many people have touched and walked through the screen door at the back of the cottage without giving it any thought. (The site currently receives about 350,000 visitors a year.) The people stopped behind me probably thought I was bonkers, but the Victorian detail of the door was a work of art and worthy of a photograph. As I ventured outside again, I couldn’t help but admire the Virginia creeper vines that adorned a window toward a roof peak and showed off its early fall coloring. Now that you’ve seen my photos and read my post, I hope you will visit A Personal Photo Challenge blog and check out the creative efforts of other participants. Thank you so much! LOVE all of these. I know what you mean about the people behind you thinking you were bonkers for taking a picture of a door. I've gotten the 'look' before too. They just don't understand do they, Donna? Maybe one day they will be enlightened...lol. The bedroom and the last one with the ivy (are creeper vines the same as ivy? )are my favorites. Great job, as usual. Hope you all are resting this weekend and know many prayers are going up for both of you. These are all lovely Donna, and bring back memories of visiting Green Gables a few years ago. Yes, we do love afternoon tea in Ontario as well, and grandma doors, the screen ones that bang shut when someone goes out. So many neat things to look at in the first photo. I love the one of the upper floor window and the ivy creeping around it. A natural window shade perhaps? I have a piece of slate from PEI, my sister visited there and painted a lovely scene on it to hang in my garden. I don't think there is anything about Canada that I don't like!! 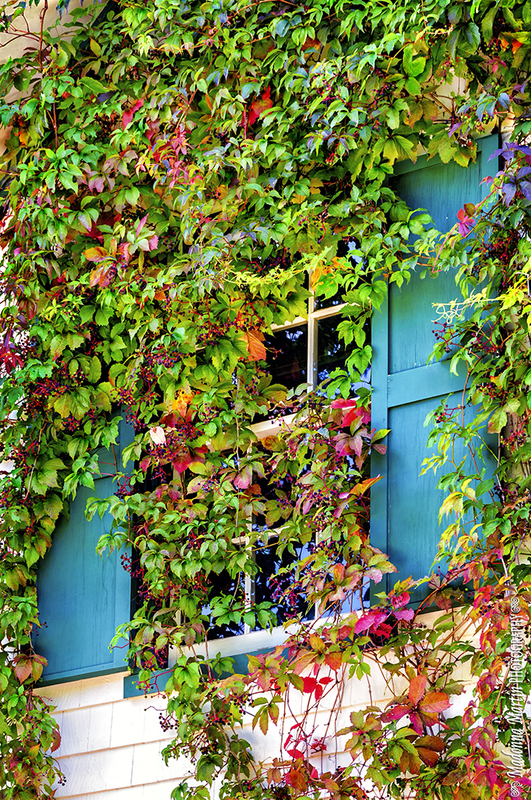 oh that photo of window partly covered by vine is so gorgeous. I love it. Your photos are amazing. Thanks for sharing. I know what you mean. People do give one an odd look when seeing you zooming in on a doorknob. I love each one of these for different reasons. The afternoon tea made me thing of Bermuda, the lace my much loved humble cottage. 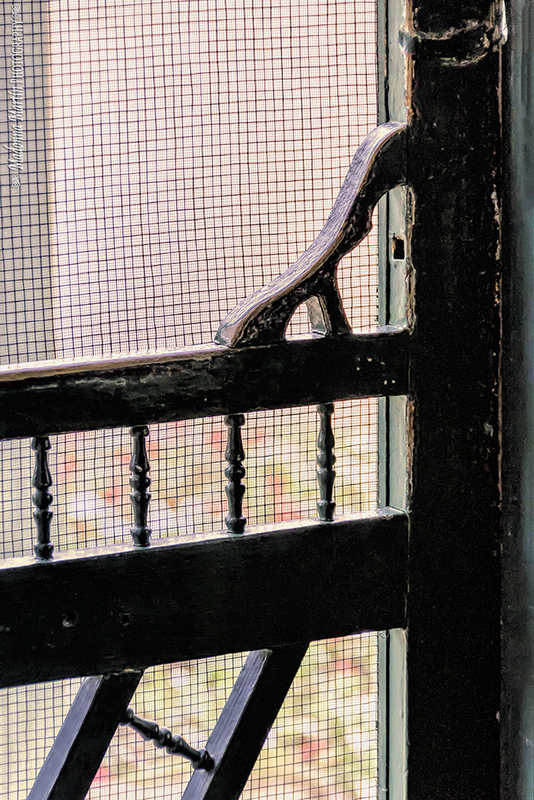 The screen door, heavy sigh! So glad you were able to contribute. for detail, Donna. LOVE these, each and every one. Wonderful photos, Donna. I've never been to PEI but I devoured the Anne books as a child/teenager. Loved the shot of her bedroom, so sweetly decorated. The simple glow of the light through the lace curtain is also striking. Beautiful photos - hope things are going well for you and Mr. Jim. What a total treat these photos are, Donna!! Thank you so much for the peek into Anne's house. I enjoyed the tour through your eyes! 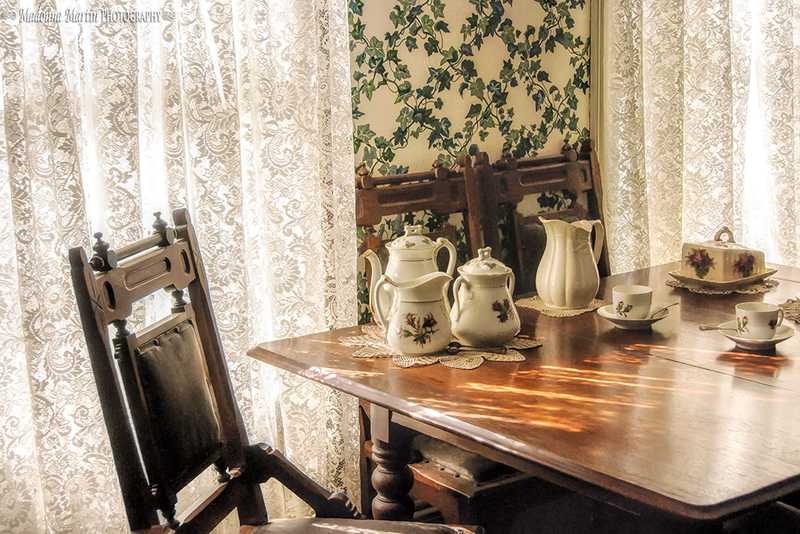 I especially loved the light shinging through the window onto the tea table. Oh, and that wonderful screen door! And this is why you are the professional...what amazing photos! I love the lace and would print it out to enjoy! And the Virginia creeper is beautiful! It brings back memories to me. My Dad let it grow all over his front porch in the old cabin he remodeled in the mountains of NC. It turns the most beautiful colors in the Fall! Thanks for the challenge. I had no idea what I would do for this one! lol Hugs to you and your sweet hubby! I'm an Anne of Green Gables fan so I really enjoyed seeing these lovely photos. I especially like the screen door, but they're all nice. The lighting is fantastic. I have a lot to learn in this department. Do hope you and your hubby are doing well. God Bless. Hi Donna, so glad to visit again. I am not a very good blogger visitor these days. Kind of low on energy and pep but I did like this theme. Love the Green Gables photos. One of my favorite books. I am like Ann I want lace panels at all my windows now. Blessings. Lovely photos Donna - I especially love the bottom one of the aqua shutters with the Virginia creeper. The lace covered window is interesting too. I never read the books by did love the series on TV! 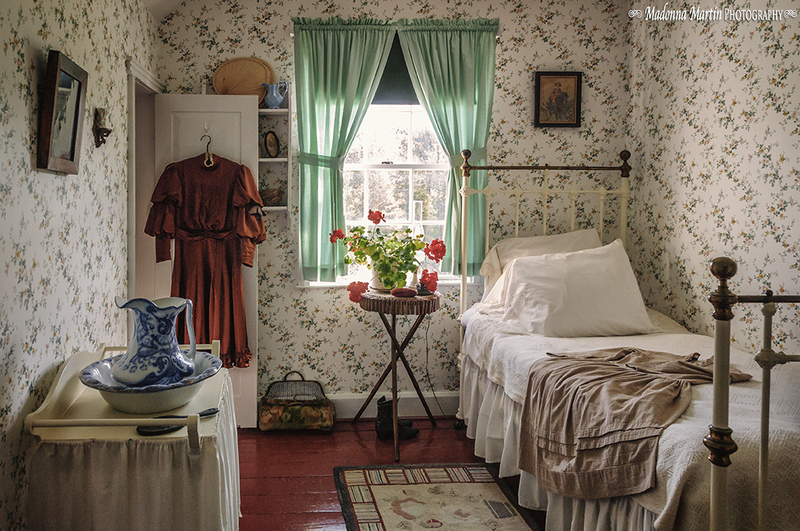 Love the shot of Anne's bedroom...enjoy your day! Love your photo! There is an online group of ladies in the U.S. who have afternoon tea 'together' every day. It's called Afternoon Tea in America - they have quite a busy forum where they share tea and other delights. It reminds me of my Canadian and British friends who stop and relax each day with a cup of tea. Thanks for the generous comment Donna dear - you are more than kind. 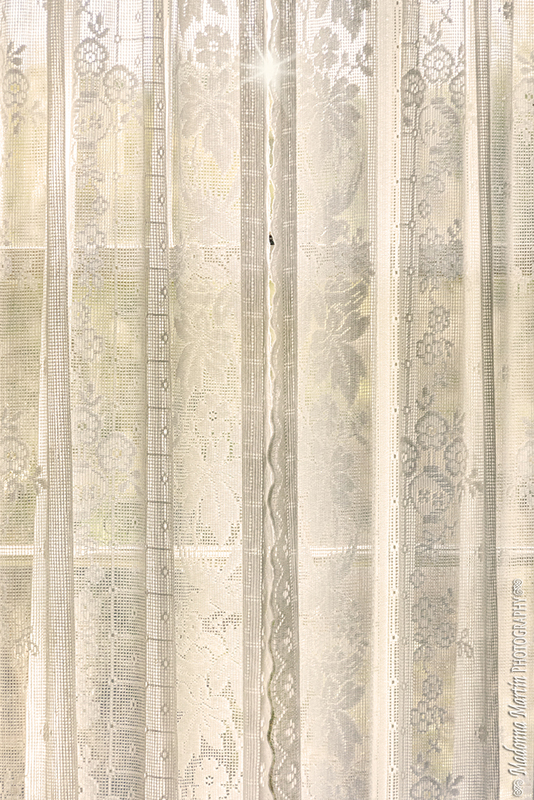 Lace curtains take me back to childhood - always hung at our windows in England - big wash day was always 'taking down the nets', laundering gently by hand, then hanging them while still damp so the wrinkles would fall out. My mum, being a seamstress, always made ours from yardage and we had really pretty designs, as are these in your perfect photos from Green Gables. The screen door shot is super - the definition of the screening itself and those little turned wood pieces. I love the wear on the paint where so many hands have opened and closed the door on a Summer's day over the years. I bet it even squeaks and has that screen door slap as it shuts! Great challenge subject Donna - thanks for giving us another opportunity to share what our eye perceives when out and about with a camera! Hope things are going well - prayers continue and thoughts are with you and dear Mr. Jim daily. Awww, these all are simply beautiful Donna! Hugs to you and Jim! Aaaah, such lovely shots. Thanks for sharing them!